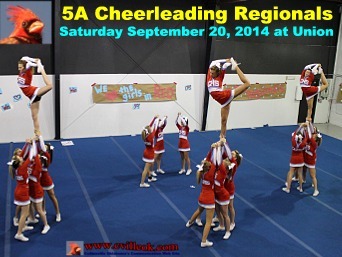 The smiling Collinsville High School Cheerleaders before their 5A Regional competition at Union HS's UMAC Saturday Sept. 20, 2014. L-R Front Row: Carlie Crutchfield, Mallory Burd, Baylee Eigenheer, Ellen Pfeffer, Lindsay O'Rourke, Paige Thompson, and Carrington Buoy. 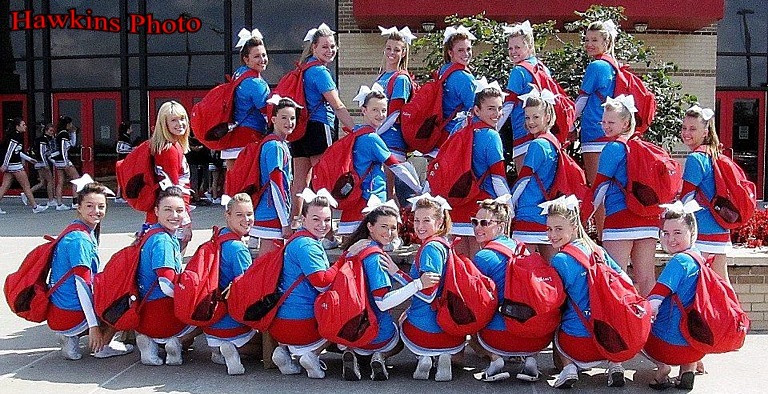 Middle Row: Mariah Hawkins, Tiffany Trimble, Chelsea Barton, Ashley Flanagan, Brooke Eigenheer, Annie Haught, Allie Dugger, Courtney Tairent, and Hayden Brown. Back Row: Shelby Braley, Lacy Crabb, Sydney Vogel, Montana Trost, Rhianna Hawkins, and Lexi Draper. After all nine 5A Regional teams competed they sat together (entertaining themselves and the fans) awaiting the awards announcements. 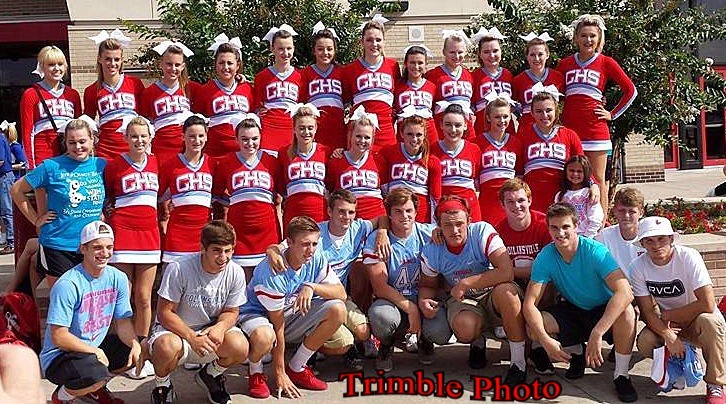 The Collinsville cheer leaders waved appreciation to their numerous (& vocal) Collinsville fans in the stands. 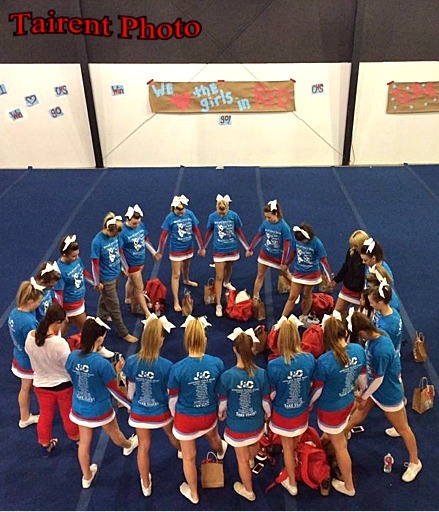 Their coaches Misty Vogel & Tiffani Dabbs are standing behind them. Collinsville will be joined at the state competition by the following teams from this regional (Skiatook 1st, Tahlequah runner ups, Metro Christian, Glenpool, Cascia Hall, Miami, and McAlester) along with other 5A teams from across the state at Norman's Lloyd Nobel Arena on the University of Oklahoma campus next Saturday September 27th. Ted Editorial: I agree with Tiffani Dabbs that the Collinsville fans were the best! ... but we expect that from Cardinal fans for all sports and activities. What impressed me even more was the Collinsville fans support for the Tulsa Memorial cheer squad that was a bit less polished than the rest and needing some fan support. The 5A Collinsville girls watched from the UMAC top level as Oologah competed on the floor during 4A competition. I borrowed this (Hawkins Facebook) photo showing the cheerleaders as they arrived at the UMAC Saturday.